Principal Cast : Johnny Depp, Orlando Bloom, Keira Knightley, Geoffrey Rush, Jack Davenport, Jonathan Pryce, Kevin McNally, Zoe Saldana, Lee Arenberg, Mackenzie Crook, Daniem O’Hare, David Baille, Giles New, Angus Barnett. Synopsis: Blacksmith Will Turner teams up with eccentric pirate “Captain” Jack Sparrow to save his love, the governor’s daughter, from Jack’s former pirate allies, who are now undead. What we think : Effortlessly engaging, the first in what would become a multi-film franchise remains the most complete, self-contained and enjoyable of all these “romps”. Led by Johnny Depp’s charismatic Jack Sparrow, and Geoffrey Rush’s Captain Barbossa, Curse Of the Black Pearl is high Hollywood hokum that looks, sounds, and is just as enjoyable now as it was back in 2003. So take a moment to revisit a time before Depp became a parody of himself, and before this series nosedived into the tidal pools of iniquity. It’s a blast. If you’d told me back in 2002 that a film based on a ride at one of the worlds most successful amusement theme parks would become a (to-date) four film franchise grossing billions of dollars and turning Johnny Depp into one of the most recognizable mainstream actors on the planet, I’d have laughed right in your face. Today, the ever present Depp remains on the Hollywood A-list, largely through his associations with kooky, weird characters (Willy Wonka, The Big Bad Wolf, The Mad Hatter, Tonto, among others) in big budget blockbusters. Although the lure of his name is tarnished somewhat nowadays, back in 2003 he was still a major draw, and headlining a film like The Curse Of The Black Pearl, a swashbuckling adventure film based on the Pirates Of The Caribbean ride at Disneyland, would only cement him deeper into pop-culture endurance. The naysayers (amongst the horde included me) scoffed at a film based on a ride would even make a profit, but hindsight being what it is, I’d love to have a time machine right now and go back and buy Disney shares in 2003. Time has obviously proven me wrong, and Curse Of The Black Pearl remains an identifiable shift in Disney’s marketing paradigm, so revisiting the movie some decade or so after release allowed me the opportunity to see if the passing of the years had wearied Jack Sparrow and Co, or whether they remained as entertaining as they were on day one. I thoroughly enjoyed this film back then, and fully expected to do so now. 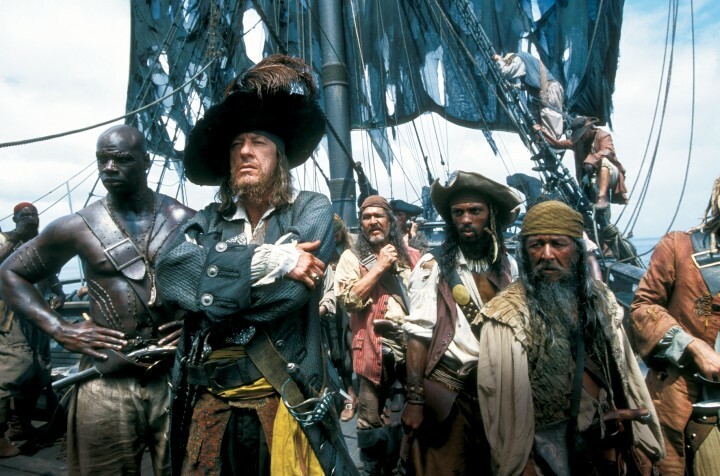 Depp’s Sparrow has become the role to which he’s most closely associated, and it’s doubtful Geoffrey Rush will ever be known as anyone else other than Captain Barbossa thanks to his exposure here, but for a movie laden with visual effects and a ponderous running time (for its time), was this a film with a barnacled hull of age, or did it still sport the sleek lines of a clipper making for the high seas? Okay, enough with the sailing analogies. Curse Of The Black Pearl stars Depp as pirate Captain Jack Sparrow, a dreadlock-wearing, kinda drunken reprobate looking to regain control of his ship, the titular Black Pearl, his control of which has been usurped by the dastardly Captain Barbossa. Barbossa leads Sparrow’s former crew on a search for the fabled Cortez treasure hoard, which places a curse on them to live as undead until all the gold is returned and the blood of deceased pirate Bootstrap Bill is spilled. Sparrow constantly outwits British Captain Norrington (Jack Davenport) and the simpering Governor of Port Royal, Swann (Jonathan Pryce), whose daughter Elizabeth (Keira Knightley) harbors a romantic crush on local swordsmith Will Turner (Orlando Bloom). In a weird twist, Will also happens to be the son of Bootstrap Bill, leading Barbossa to try using him to lift the curse upon he and his men. In spite of pirate movies being all but anathema to Hollywood in the aftermath of Renny Harlin’s spectacular (but fun) bomb Cutthroat Island, Curse Of The Black Pearl had almost no right being as entertaining as it is. While its roots lie with a theme park attraction, the narrative within this film is remarkably entertaining, as it twists, turns, doubles back and spins itself into knots to excite and enthrall the audience. Yet, although the story might be a romp, it’s the actors who hold it together. Director Gore Verbinski (Mousehunt, The Mexican) has assembled a terrific top-line supporting cast to back up the four main leads, particularly Pryce, who steals almost every scene he’s in, and the duo of Lee Arenberg and Mackenzie Crook as a due of comedic relief pirates provide plenty of sly laughs that counterpoint Depp’s bravura performance as Sparrow. Yeah, these films are all about Johnny Depp, whose work in this movie was nominated for both a Golden Globe and an Academy Award in the Best Actor category. Imagine, a golden Oscar statuette in the hands of a pirate! Saints alive! 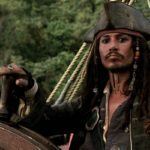 Depp lights up the screen with his slantways performance of Sparrow, who might either be utterly stoned or totally plastered (or, more likely, both), as he slurs and Monty Python’s his way through this rambunctious screenplay. Verbinski’s canny enough to let his leading man shine, but wary enough of the overpowering nature of a role like Sparrow to let the secondary cast do their bit as well. While Geoffrey Rush’s Barbossa isn’t nearly as fun as Sparrow, he serves as a worthwhile villain in the most tragic sense, and although the sequels would go on to vacillate too much between good and bad for my liking, here, Barbossa’s motivations ring particularly true. The “younger demographic” casting of Orlando Bloom (then white-hot following the Lord Of The Rings trilogy) and Keira Knightley (coming off Bend It Like Beckham) was delicious at the time, and although watching these two go all doe-eyed at each other across the ocean might feel like being force-fed romance for the sake of it, both Knightley and Bloom acquit themselves of pandering melodrama quite well. In fact, the subtle subtext of Elizabeth’s attraction to Sparrow (or, perhaps, vice versa) is underplayed superbly by both Knightley and Depp, a plot factor which crept into the immediate sequels to their detriment, unfortunately. Jack Davenport’s Commodore Norrington is typically stiff-upper-lip stuff, and although Davenport’s role is essentially to play both the spurned lover and the inadequate pursuer, he delivers on what is quite a thankless task. Curse Of The Black Pearl is by its very definition a gigantic blockbuster. Money leeches from every scene, from the streets of Port Royal, the decks of the various ships within the story, and the massive setpieces that take up any number of minutes of screentime. Sword-fights, ship-to-ship combat, and plenty of “arrrghhh me hearties” dialogue give this film a tangible depth of design; the costuming and production work on this film is superbly realized, and holds up against most of today’s green-screen ventures. You can see the money up on the screen, and it makes a tangible difference. Heck, even the CG work here is still excellent. It’s barely aged at all, although one could say the various skeleton effects and backdrop work would feel a little “smoother” were it being made today. That said, the way Verbinski films it, integrating the more ghostly, ghastly effects within the live-action platework, it all just clicks into place. While the franchise might have scuppered itself with increasingly inane sequels (the 2nd film is by far my favorite, with film 3 and 4 remaining blips on the radar), it’s fun to look back at where it all began and revel in the sheer delight of a film designed purely to entertain and nothing else. There’s very little subtext, zero moral message or life lesson to be learned; Curse Of The Black Pearl is pure popcorn fun, an unadulterated (if somewhat PG) adventure film that will keep both adults and kids amused for a few hours.